Having tried and failed to upload this from home, I’ve finally given up on our dodgy internet connection and decamped to Mum’s house. We haven’t got fibre optic cables to our village yet. And we live a mile down a single track lane. So there’s really no hope for us. The only up-side to this story is that mum made a cake. And regular readers know how much I love cake! 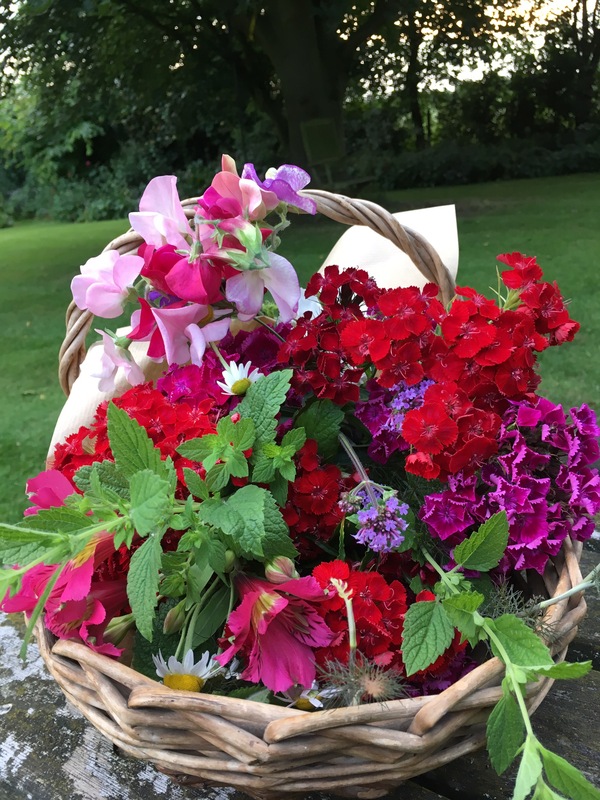 As I’ve said before, I grow and pick flowers for my MIL Joan as a way of keeping her connected with me and my garden- showing her what’s in flower 52 weeks of the year. But this time I also picked a bouquet for a friend who is having an operation today. Hopefully the sweet williams, alstroemeria and first sweet peas of the season will brighten her day. Flowers do have the power to calm and reassure. 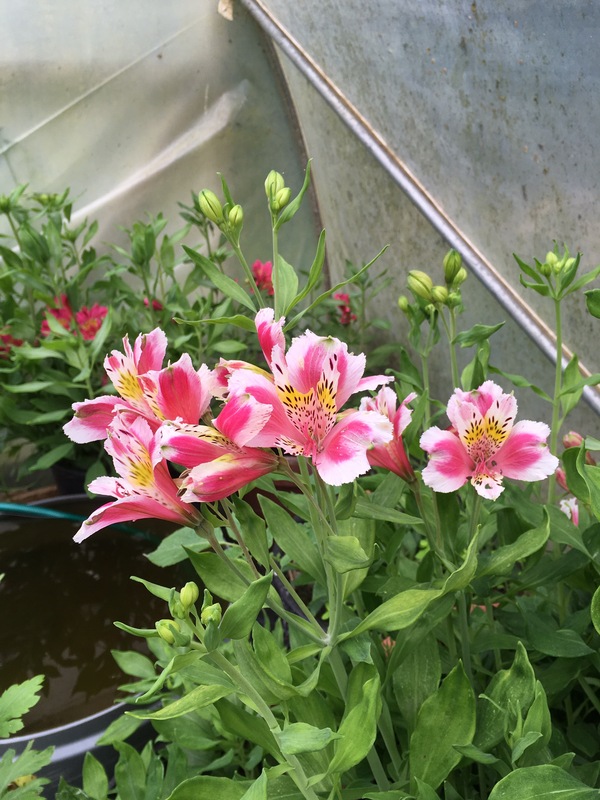 Pink alstroemeria -from Viv Marsh Postal Plants, flowers virtually all year round in my unheated poly tunnel. I grow them in 60cm pots, as the roots have a reputation for spreading. Growing them under cover protects them from the weather and also from snail and slug damage. Flowers last for about three weeks in a vase. 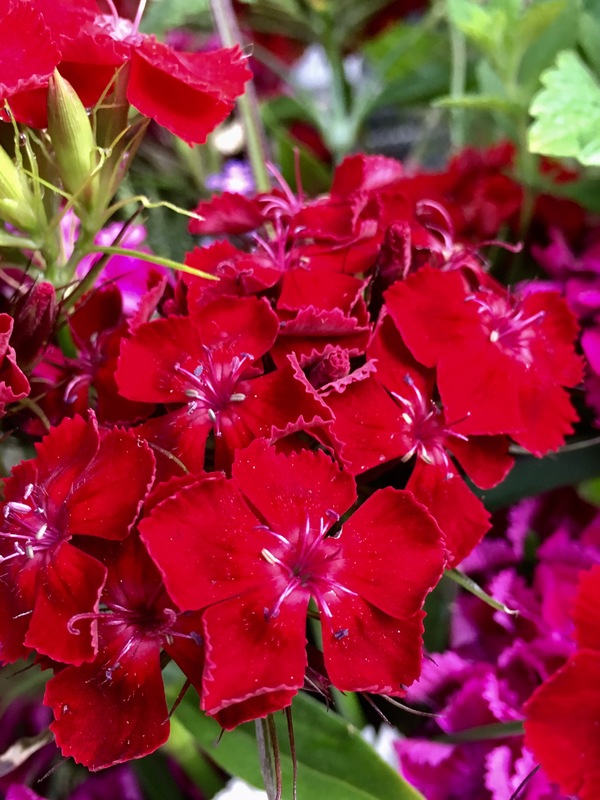 Easy to grow, repeat flowering, and long lasting. They are no trouble at all. Please excuse the state of my poly tunnel, which needs a good clean. I’ve bought some special detergent from LBS Horticulture, which apparently just needs spraying on. Will report back when I’ve tried it. The one problem with poly tunnels is the algae. It’s not like having glass which can easily be washed down. And it builds up on the inside and outside surfaces. Still, it was cheap to put up and gives me a dry working area in the winter. I planted these sweet williams last summer. They arrived in a parcel as a twitter plant swop. I love free plants, and always have loads of my own to spare. I’m quite often posting margarine containers full of little seedlings all around the country. You can see my rather rickety hazel A-frame structure for sweet peas in the background. I just hope it doesn’t blow over in a storm. I love the jewel-like colours of these sweet williams. 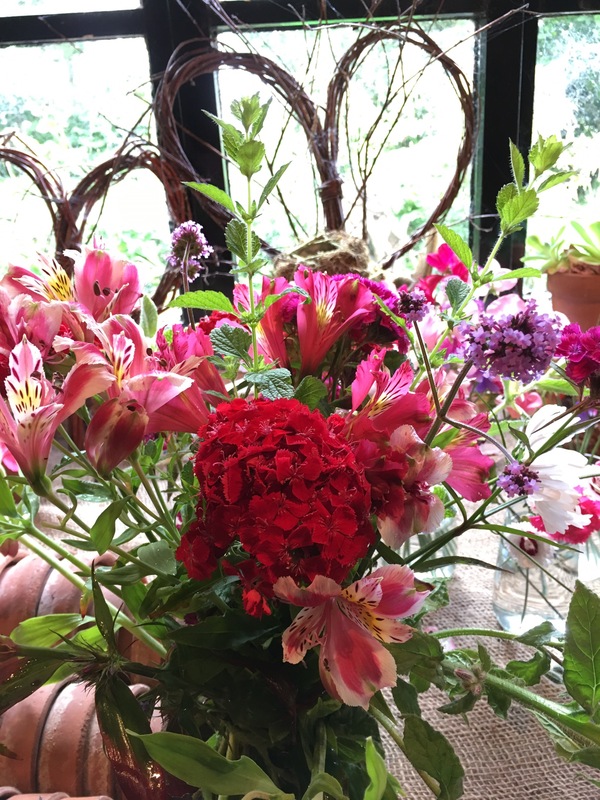 They last for ages in a vase and produce large quantities of flower in a small space. I’ve just sown some more to plant out in the autumn. The seeds germinated in two days in all the hot weather we’ve been having, and there are hundreds of little seedlings to prick out. My sweet peas have just started flowering. I had a disaster with the autumn-sown seed. A mouse got in the propagator and snaffled the lot in one night. There was just a sea of snapped off stems. Not to be deterred, I planted the stems as if they were cuttings, and amazingly they carried on growing. 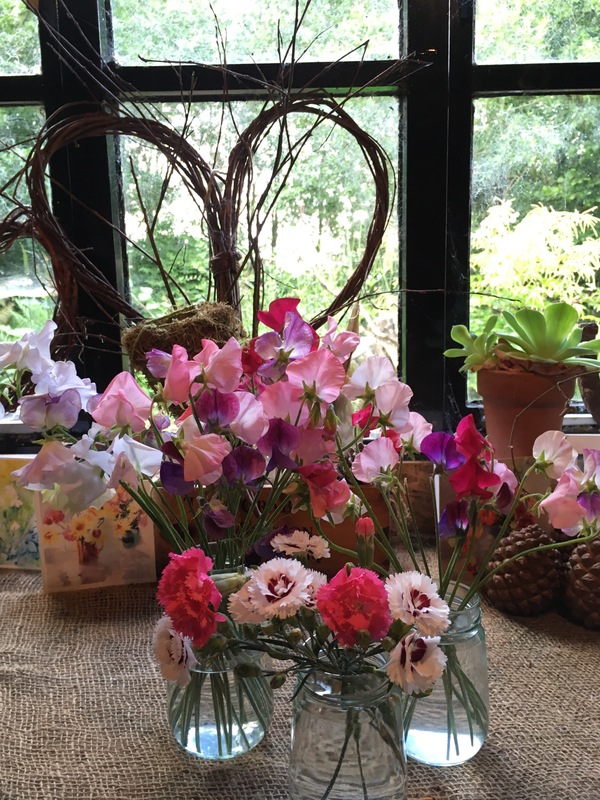 Another tip if you are growing sweet peas is to use the pinched-out tips as cuttings. They will produce plants that will flower right up until November. I discovered this by accident when I left the pinched-out tips on a tray of moist compost and they rooted down and planted themselves. Aren’t plants just amazing. 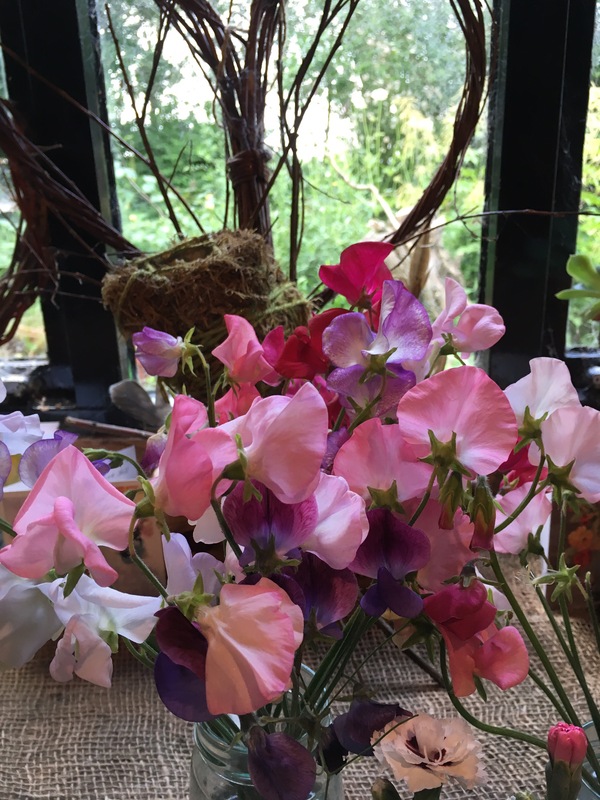 I’m growing High Scent, a good reliable sweet pea variety- and it really does have a wonderful old fashioned scent. It was raised by Keith Hammett and introduced in 2003. It has a creamy ruffled flower with a delicate lilac edge. I’m also growing Albutt Blue, a very pretty pale blue flower with a deeper blue picotee rim. It was raised by Harvey Albutt and introduced by Eagle Seeds in 1999. It’s been a favourite of mine ever since. I buy seed from Easton Walled Gardens, Roger Parsons and Eagles. If you don’t have facilities to grow your own, you can buy mail order plants in the spring from Easton. Also, Mum and I spotted some really great sweet pea plants at Coton Manor garden nursery in Northampton in May, for just a few pounds each. It’s good to have a back up plan. I always put lemon balm and mint in my cut flower bouquets. It goes so well with the sweet peas and roses. And for my friend, who’s spending the day in hospital, it will be a lovely scent to come home to. My potting shed, where I’m sowing seeds and making cut flower posies, overlooks a horseshoe pond and tall willows. On the other side of the trees is this view of surrounding countryside. I’ve cut holes in the hedge to make viewing points through. And all my hedgerows are woven with scented roses and honeysuckle. 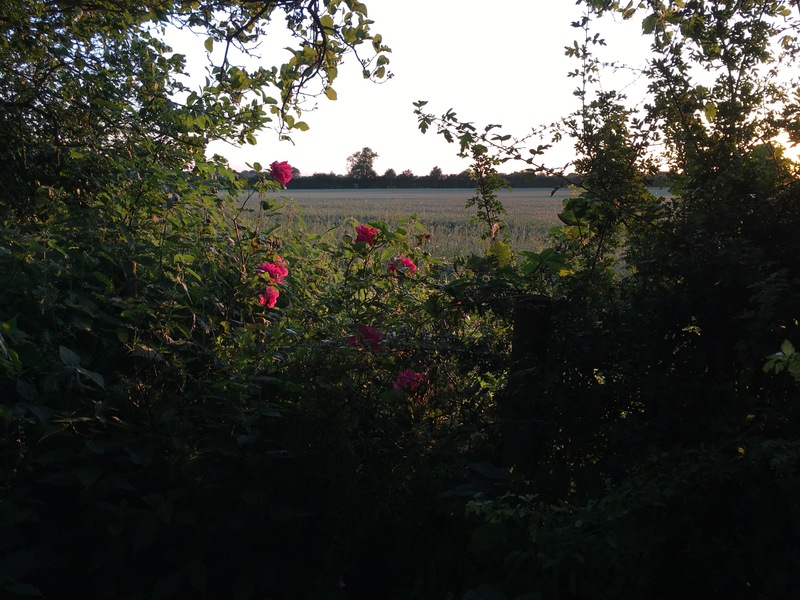 It’s a peaceful place….just don’t look at the weeds! ← Wordlesswednesday- will it be Britain’s hottest June day for 176 years? Your sweet peas and sweet williams are gorgeous. 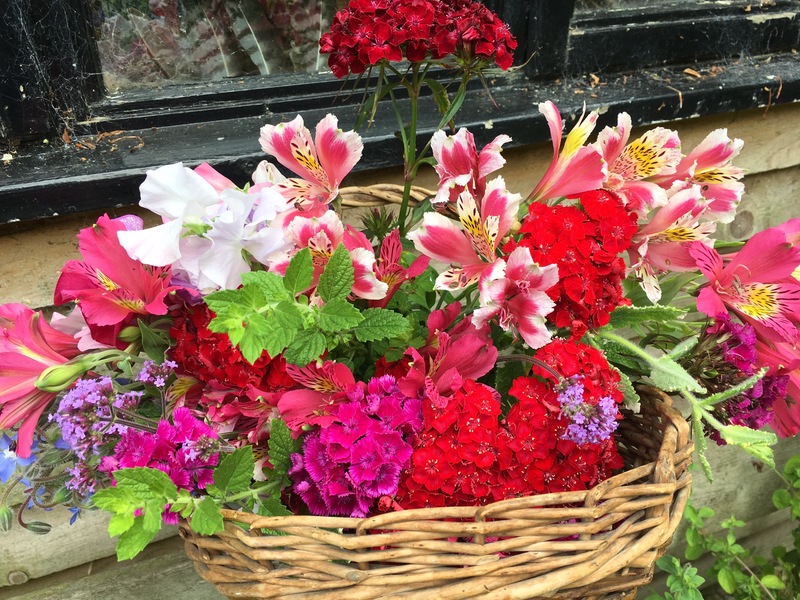 What a beautiful summer basketful of flowers. Karen her basket of flowers is gorgeous, her friend must have been very pleased to receive it. Sweet Williams love and smell wonderful. Smell Peas are beautiful and their fragrance is magical. Greetings from Margarita. 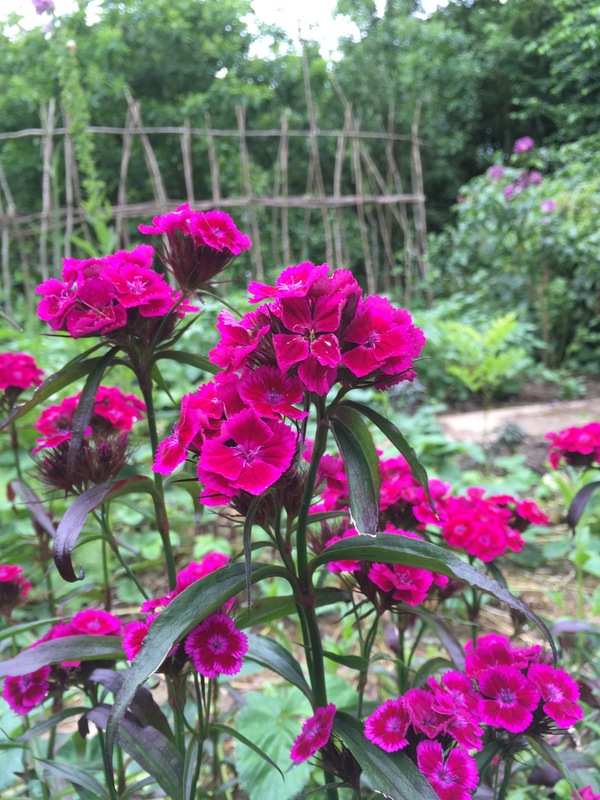 It is good to see someone else growing Sweet Williams. I always have Sweetpeas. Sweet williams are such good value. They flower for ages and don’t take up much space. Thanks for reading and getting in touch Brian. All the best. Hi, Karen! It was nice to meet you on Sunday at Cathy’s open day. I thought it would be rude not to come and visit your blog. Loved seeing your sweet peas and sweet Williams. They’re two of my favourite childhood flowers. I must try to grow them more often. I know you must have enjoyed Cathy’s cakes on Sunday – the lime and coconut and the lemon drizzle cakes we know were delicious! Thank you, Karen, that would be lovely! Yes, Cathy’s garden is very inspirational – full of lovely ideas you would love to copy!